All 23 Eagle Palms can now be managed from the Palms tab in Individual Advancement. Boy Scouts and their parents can view the status of all Palms from one page. Boy Scouts now have the Community Service Reports that were added for Cub Scout packs and Girl Scout troops last month. Cub Scouts and Girl Scouts can now limit access to Forms & Documents by dynamic subgroup. Two inventory reports were added to the Cub Scout and Girl Scout sites. Troop 3752 of Canton, Georgia! The photo collage in the banner shows what this troop is all about, and the rest of the Home page provides the rest of the details. 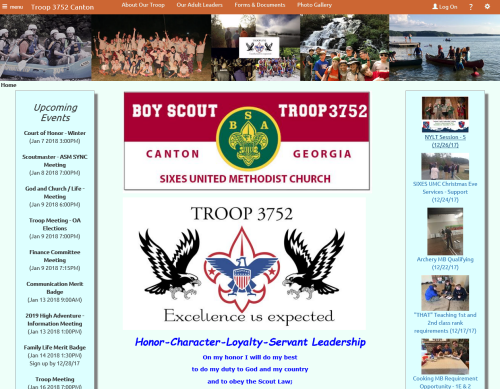 The Adult Leaders page includes a photo of every current leader, making it easy for new scouts (and their parents) to find the resource they need. And check out the fun videos - these scouts know how to have a good time!